the basement of Pudu Plaza. IT took three weeks? advance booking to secure a table on a weekend, and the order had to be placed at least three days prior to the actual meal, specifying the dishes and number of diners, so that the chef could shop accordingly. This might sound like an exclusive restaurant in one of the city?s finer dining spots, but it wasn?t: it was a most unlikely location, a stall located in the basement of a mall in Pudu, downtown Kuala Lumpur. 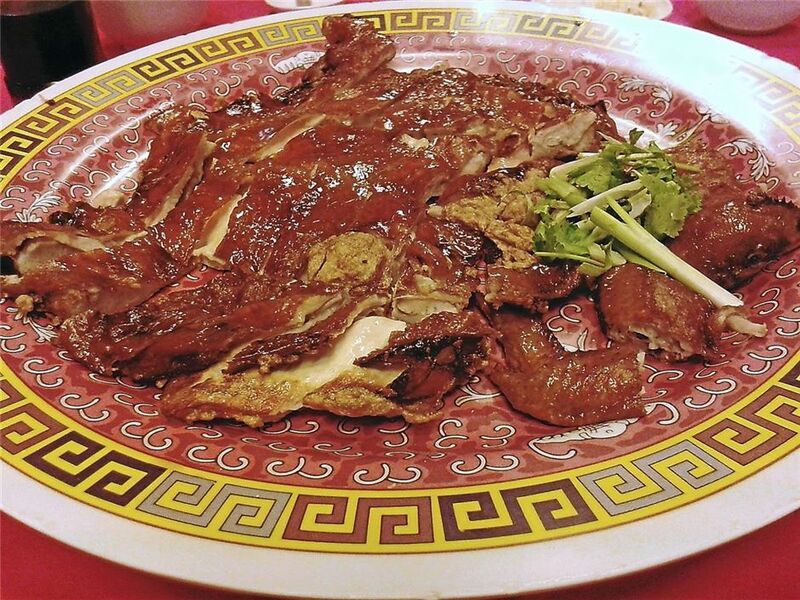 Foodies have long known about Hiong Kong Restaurant and Chef Wong, who turns out dishes worthy of a five-star Chinese banquet hall, but it was my first time there. Pudu Plaza wasn?t difficult to find, and when I entered, it reminded me of a small-town shopping mall, with its array of brightly-coloured goods and almost cut-rate prices. Down into the lower ground floor, I found the stall with perhaps a half-dozen tables in the dining area outside. All of the tables had been booked beforehand. My friend CK who had arranged the dinner was already seated, making for a dining party of five ? not ideal, given that most of the dishes are grand affairs better suited to a larger party of 10 people. Big pieces of pomfret with celery and beans.The pomfret bones were fried and served separately. The other tables filled up, with around 10 people each, and we chatted while we waited for our food. There was no such thing as changing your order or adding a new dish or even adding more diners, as the whole dinner was scripted for a fixed menu for a fixed number of people. There was no use trying to rush Chef Wong either, and dinner turned out to be a leisurely affair, starting at 7pm. We didn?t finish until almost 10pm. Eventually, our first dish arrived. It was fried boneless chicken with a thin layer of meat, but the ?meat? was actually fish paste. Crispy chicken skin matched to fish paste was strangely exotic and very tasty, with the blend of chicken and fish making for an oddly agreeable combination, especially when taken with chilli sauce. This dish is not commonly encountered as it is time-consuming to prepare: the chicken is first deboned and defleshed, and the cooked chicken skin is spreadeagled on a rattan frame. Fish paste is then applied to the inside of the skin, and has to be smoothed out by hand, so each dish is very labour-intensive. The whole chicken is then deep fried in the rattan frame and cut into smaller pieces while still very hot for serving. An unusual dessert of cooked yam in a caramelised sugar shell. We chatted while waiting for the second dish, another good reason to have a large party of people. We noticed the other tables being served as well, and the dining style appeared to be several tables being served at the same time over the course of the evening, rather than each table being served in sequence. The yam-basket lobster combination was a popular choice, based on what was served at the other tables: a large lobster, with various accompaniments, and a small yam basket. Our second dish was certainly interesting: in the middle of a large plate was a combination of Chinese scallops and browned garlic pips. This was surrounded by a ring of lush broccoli, and some odd-looking appendages, which turned out to be goose feet, with a thick brown sauce over everything. The scallops and garlic were lovely, each with a distinctive flavour, and I liked the broccoli, but I am no fan of even chicken feet, never mind goose feet, which are a delicacy. I made a brave attempt ? the webbing between the digits had a certain texture and a waxy taste, but next time, I?ll stick to goose meat instead. The night was getting along and we were exchanging ghost stories when the next dish arrived. This was a huge plate of white fish pieces with celery and beans. The fish, being pomfret, was very fleshy, sweet, firm and fresh. It was the largest one I?d come across in a long while. The pomfret bones had been coated in batter and deep fried. They came in a separate plate with chilli dipping sauce and could be eaten whole like crunchy crackers as the chef had only prepared the smaller sections of bone. Given the enormous fish, we were getting quite full. Unlike the typical Chinese dinner, this one involved lots of conversation and tea in between dishes. Dish No.4 was a lovely combination of finely-sliced lotus root, crunchy macadamia nuts and gingko seeds. Fortunately, the serving size was reasonable because the last dish was a really big serving of lotus leaf rice, another traditional dish of glutinous rice cooked with ingredients such as Chinese sausages, chicken, mushrooms and shrimp and wrapped in lotus leaf. It was wonderfully fragrant, and the ingredients well mixed in with the starchiness of sticky rice, but by then, we were all reaching capacity, and it was getting rather late. We weren?t finished yet, however, and neither were the other tables. The chef had timed it so that we all finished about the same time, although we had different dishes. 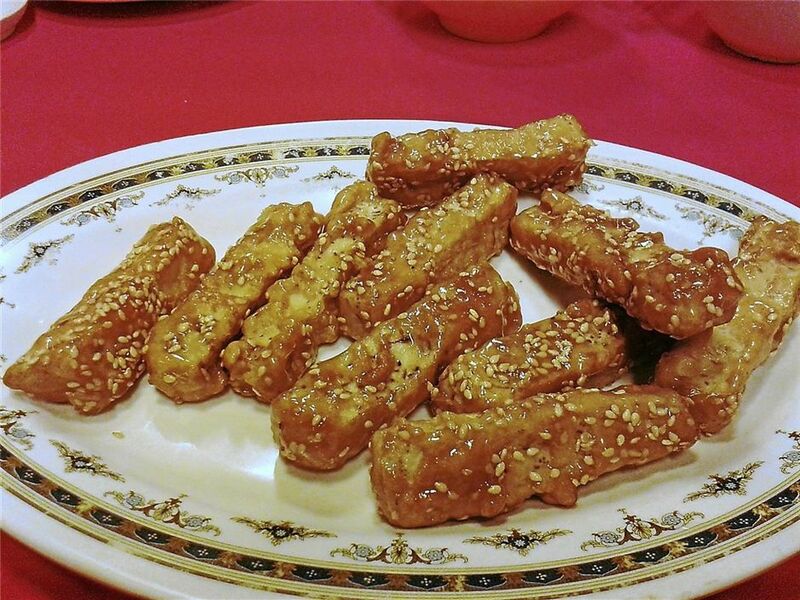 Chinese desserts are generally quite limited, but this one was new to me: it was cooked yam coated in caramelised sugar, and served in rectangular pieces. They were still hot when they arrived at the table, and were sweet and crunchy on the outside, and soft and fluffy within. It was something quite new and unexpected. All the food was prepared at the stall, with a few helpers preparing the ingredients while Chef Wong was the sole cook, presiding over a couple of woks on big cooking flames. We had a look at photographs on the menu, and it was certainly an exotic collection. Most of the dishes were unusual or rarely encountered, such as crab in milk in yam basket, and many dishes featured exotic ingredients such as abalone, whole lobster, sea cucumber and fish lips. There were also more mundane offerings such as sweet and sour spare ribs but not many. It was obvious that you couldn?t just turn up and order a meal. The meal cost RM350 in total, which didn?t seem exorbitant, given the experience we had just had: it seemed more like an occasion than a meal.